Most brides can get through the selection process for the bouquet flowers pretty fast. There’s usually a budget option and a premium one. If you wish to make your wedding truly special, you might consider trying out some more innovative ideas. 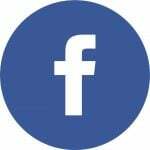 In that case, you can easily get lost when researching flowers and arrangements as there are countless bouquet styles out there. Creating a meaningful floral arrangement can become more difficult if you’re not entirely sure about the message you’re trying to convey. 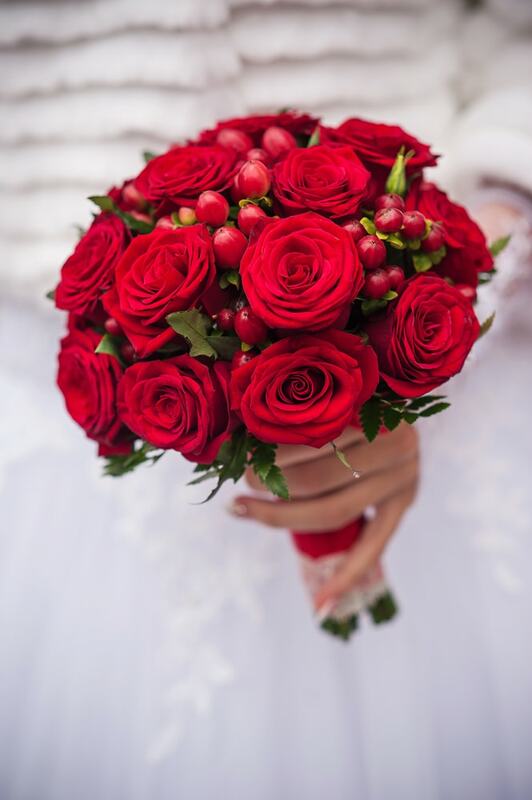 Bridal bouquets have the power to bring back some lovely memories depending on the flowers and the fragrances used. Get inspired with the following ideas that we’ve selected by thinking of brides that love flowers and wish to create a rich bouquet that’s full of sentiment. 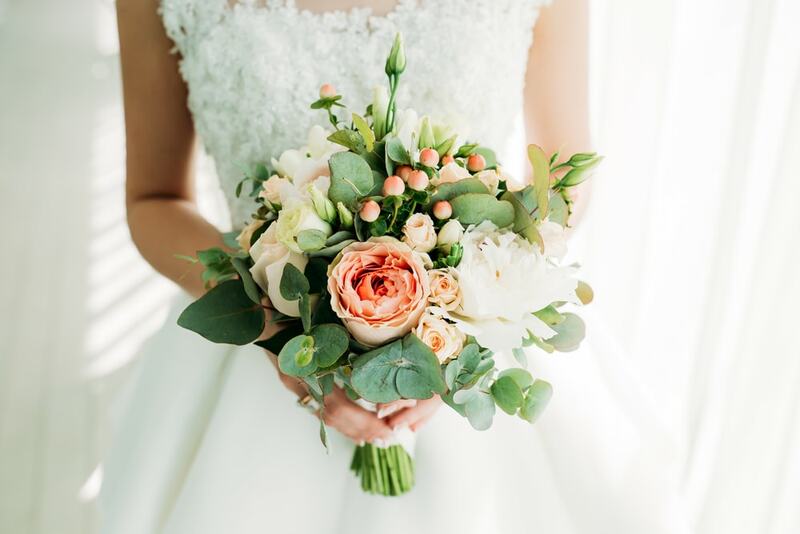 When you’re trying to figure out how to choose the ideal bridal bouquet, it’s essential to discuss with your florist and arrange for multiple day-of options. This is a good idea because you can make your selection of the best bouquet without feeling like you’re limited by one option only. Once you’ve picked a good bouquet out of three options you can give the other two as gifts before the wedding. Alternatively, you can change the original bouquet to a fresh one to ensure that florals stay vibrant for longer. If you want to give your bridal bouquet a unique look, consider integrating some non-traditional elements. Items such as fruits, berries, and others can help to craft an original bouquet that stands out from the crowd. The fruits in this bouquet look lovely together with the assortment of flowers adding an unexpected effect. 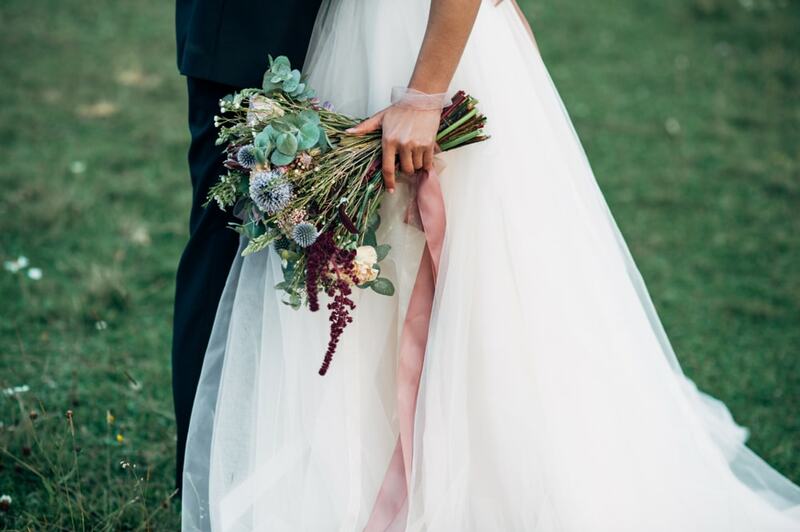 The dress has an important role when it comes to the wedding ceremony and you can take advantage of its aesthetic to figure out how to select the best bouquet of flowers. While your favorite flowers need to be prioritized when crafting an arrangement, it’s important to ensure that the resulting bouquet won’t compete with the silhouette of the dress. Try to find the right floral combination to complement the gown’s intricate details. One of the simplest solutions to try if you wish to make a bold bridal bouquet is to go for oversized blooms. Depending on your preference, you can adapt the flowers to create the desired impression. 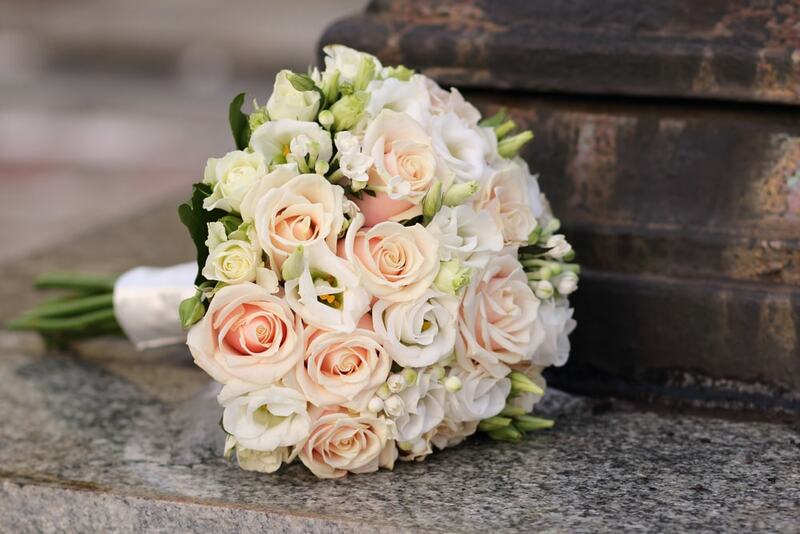 This elegant rose bouquet finds a good balance as it mixes small pink flowers with larger white blooms. You don’t necessarily have to put a lot of effort when showcasing the oversized blooms given how they’ll naturally draw more attention. Not everyone’s a fan of bold and bright colors when it comes to creating the bridal bouquet. Working with a more neutral color palette is recommended if you have a more subdued bridal style. Neutral tones can often give off a more romantic impression with a wedding dress and many brides favor this look. 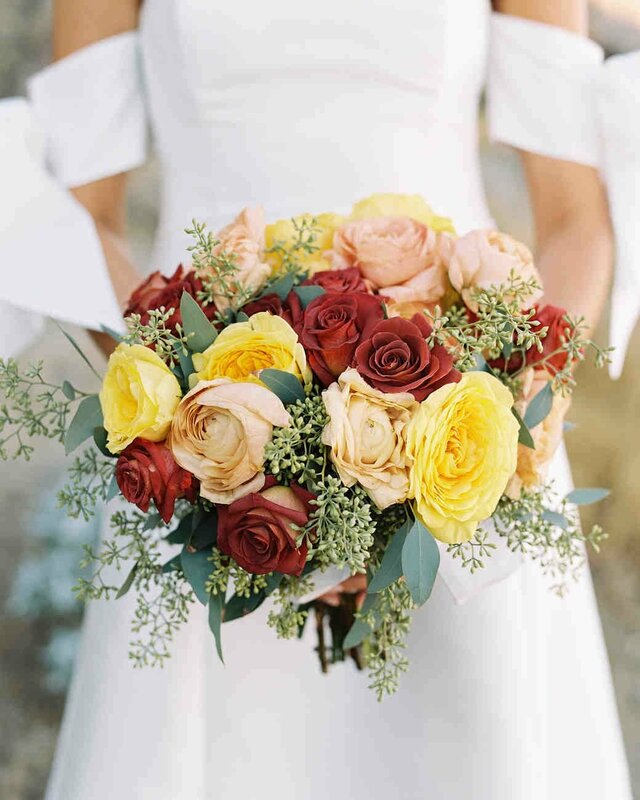 As opposed to fans of neutral tones, some brides enjoy a more colorful bouquet. It’s a good idea to play with some vibrant colors to add a whimsical effect to your wedding look. Coral and purple hues are especially recommended if you’re looking to bring in more daring splashes of color. Another great benefit of using more colorful flowers for your wedding bouquet is that photos will also look much nicer. 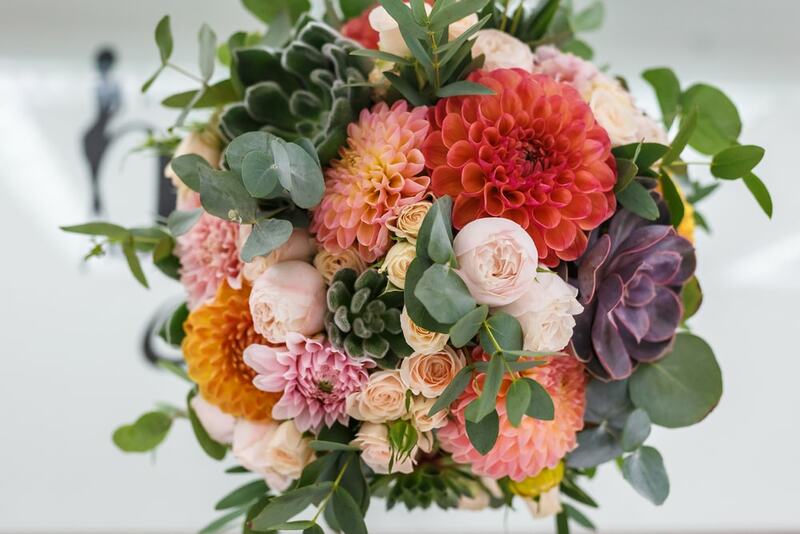 The vibrancy of the bouquet is sure to stand out against the white backdrop of your wedding gown, so incorporating a more colorful palette is a fantastic idea. 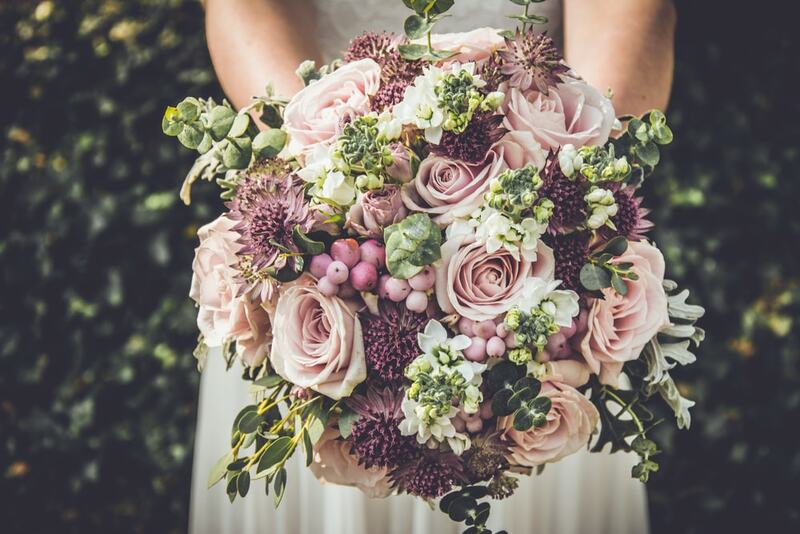 While most brides will usually focus on color when designing the bridal bouquet, the texture of the arrangement needs to be properly emphasized as well. One of the easiest ways to add some texture is with the help of an extra layer of greenery. 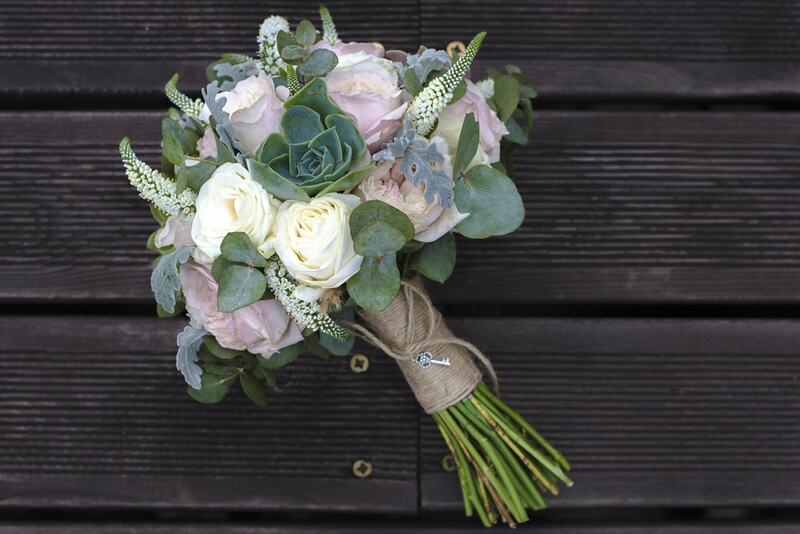 Many plants such as eucalyptus can enhance the look of the wedding bouquet and give it a more organic feel. Having a bridal bouquet of the same flower may seem strange for some people, but monobotanical arrangements can offer a striking impression. 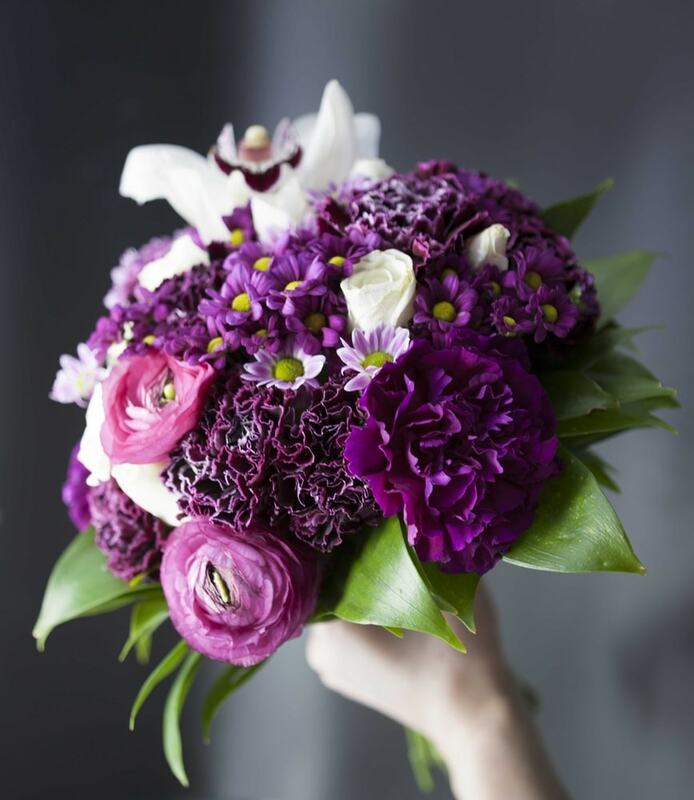 When combined with a very elegant wedding style, the look of this kind of bouquet will seem more sophisticated. 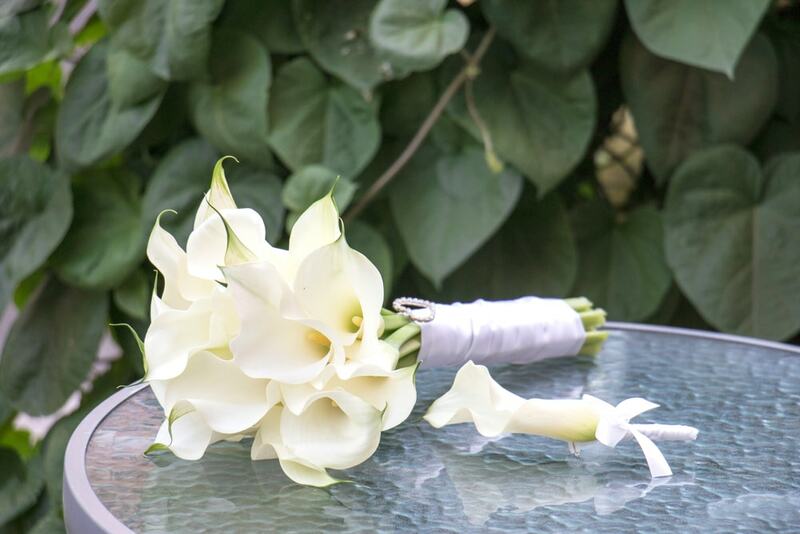 One solid example is a cluster of white Calla lilies given their timeless aesthetic. 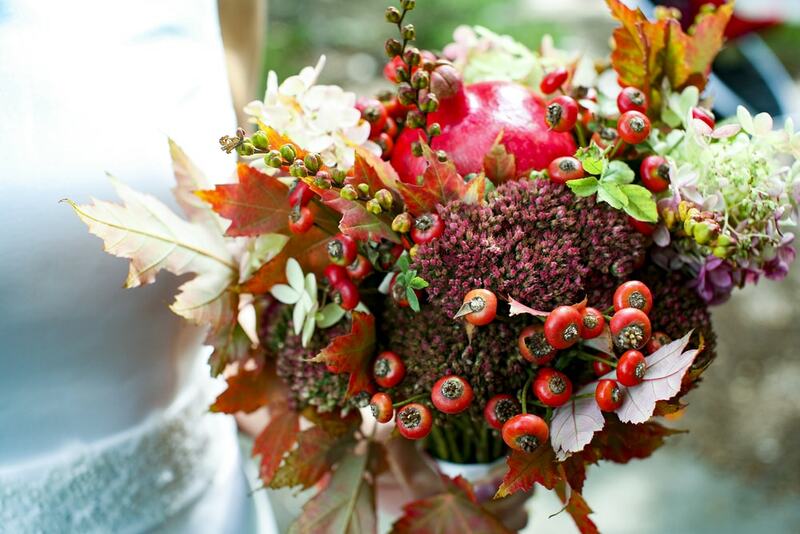 Giving your bridal bouquet a seasonal theme represents a nice idea to create an inspiring look. Spring flowers can look particularly great and there are many choices you could try including hyacinths, daffodils, and peonies. 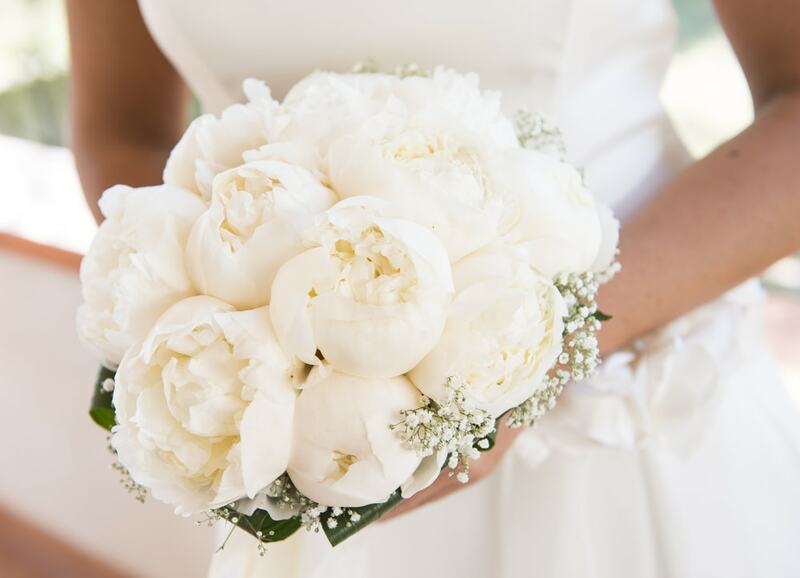 The bridal bouquet shown here has a simple appearance, but the white peonies provide a very fresh look to match any wedding gown. 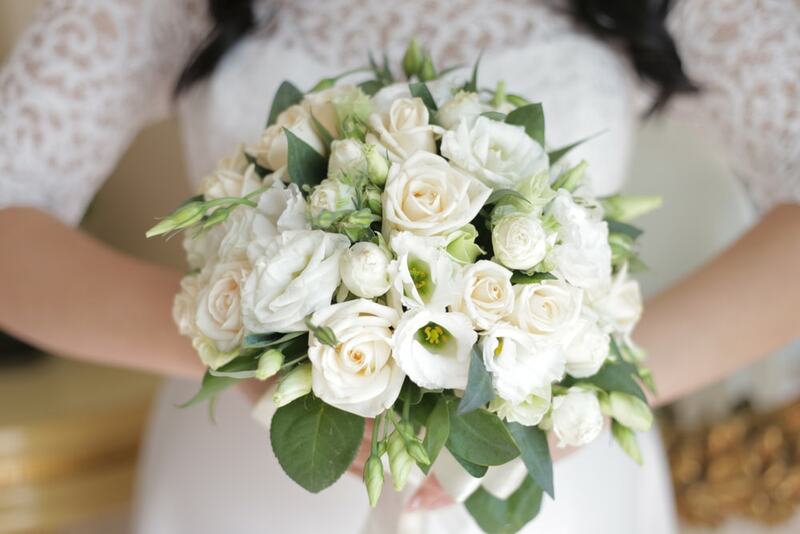 Sometimes the best looking bridal bouquets are the classic ones. If you prefer a more old-fashioned style, you can’t go wrong with some traditional blooms that focus on creating a gentle impression in terms of both texture and color. This bouquet of roses is crafted in an ethereal style that will delight your senses without being too overwhelming to the eye. One neat floral arrangement to consider is this bridal bouquet that shows off a bohemian theme. The colors and textures are selected to seamlessly blend wild flavors with modern elegance. The bohemian theme could be a perfect style for lots of brides who want a more special-looking bouquet without looking too fancy. 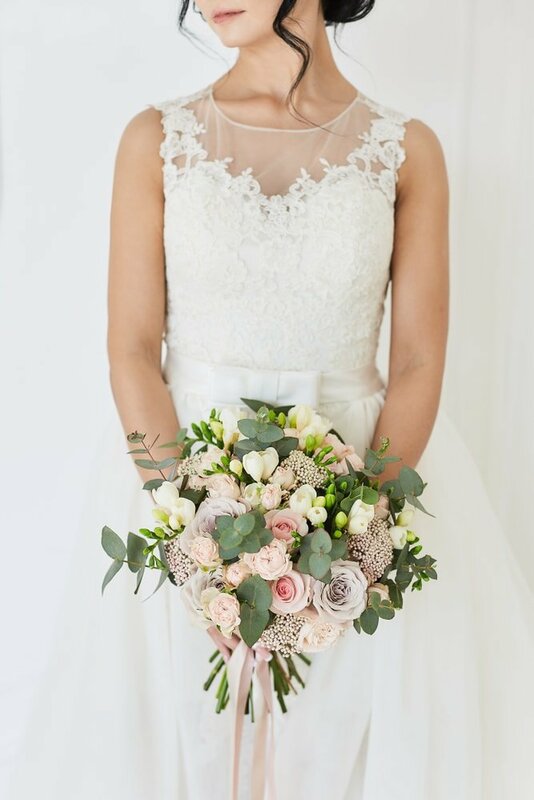 You can make a bolder statement with your bridal bouquet if you choose a monochrome style given how it pairs so well with the white of the wedding dress. Monochrome doesn’t have to mean using a bland color. Try to stick to a highly saturated color like an enchanting red or pink hue to take the visual impression to a new level. To make a bridal bouquet more stylish, one great method is adding some colorful ribbons. There are many ways to go about it, but if you choose to integrate some ribbons, always remember to take into account the color scheme and texture. The right ribbons will be able to complement the overall style of the bouquet making it more elegant. 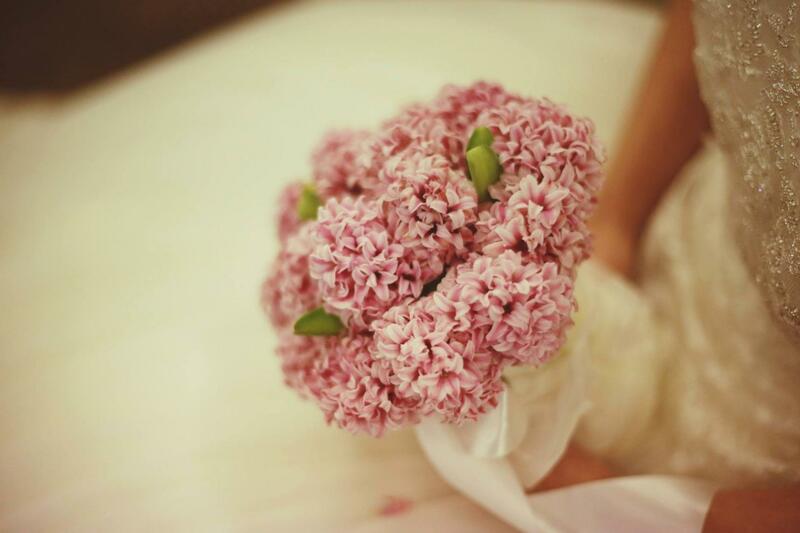 Lilac flowers offer deliciously fragrant blooms and their look can make it very suitable for vintage style weddings. 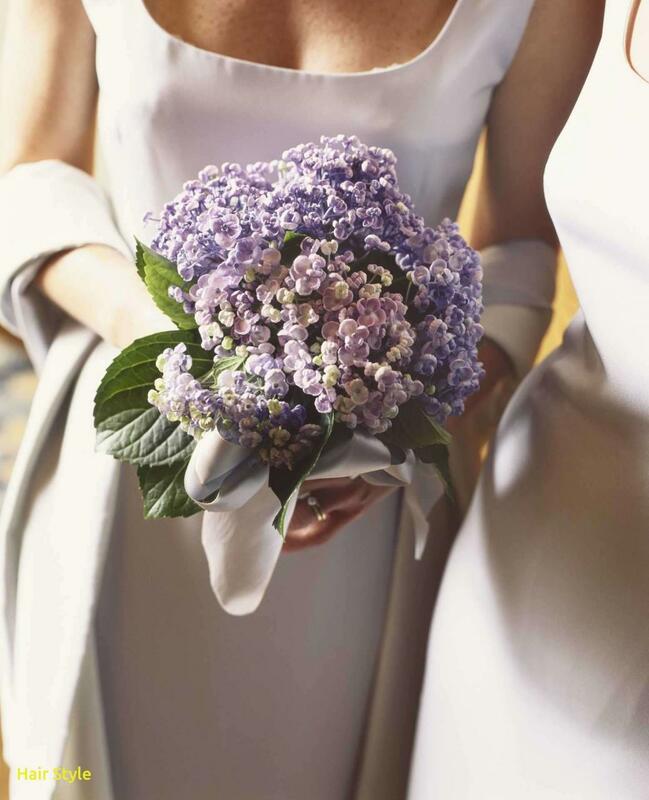 Clusters of lilac can be helpful to use when designing a fluffy bridal bouquet that showcases a wide range of colors. If crafting an entire bouquet using just lilac flowers seems too simple, you can easily use these lovely blooms as vibrant accents. Dahlias have this great quality of seemingly bursting out of the floral arrangement. That makes them solid choices for bridal bouquets designed to be as eye-catching as possible. Combine dahlias in different hues with roses and succulents for a rich and vibrant look. 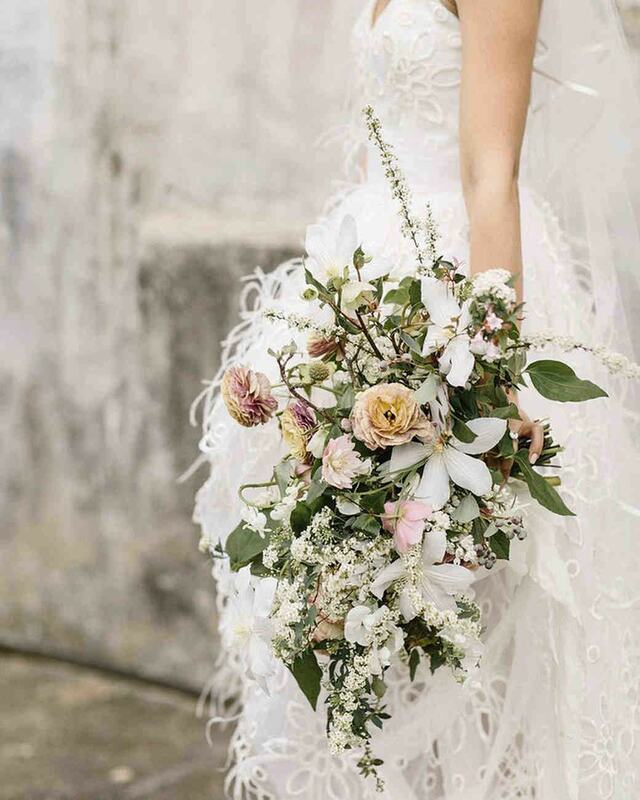 If you’re searching for creative additions to your bridal bouquet, take a look at this stylish arrangement that makes use of feathers. This is definitely an unexpected element that beautifully complements the delicate look of roses and peonies. Feathers can provide some much-needed textural layers that should fit with lots of different floral arrangements. 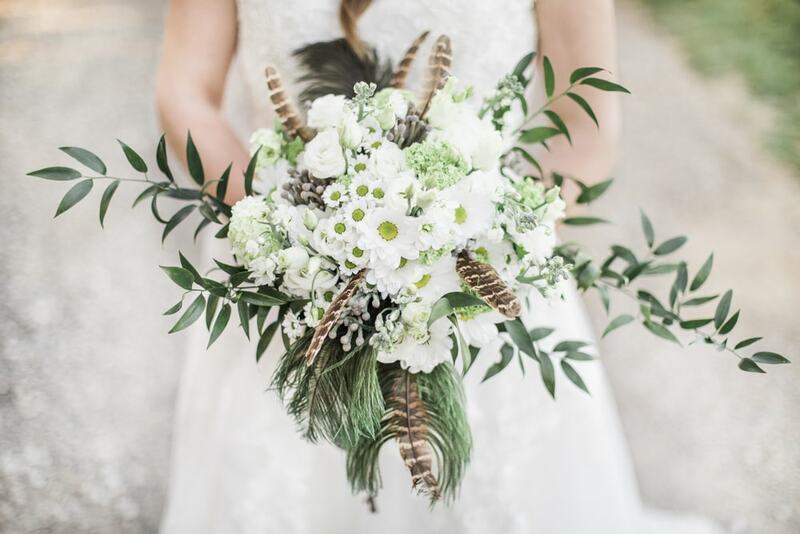 This is another bouquet that incorporates feathers and pairs them in unique ways with fresh greenery and neutral tones to achieve a rustic effect. 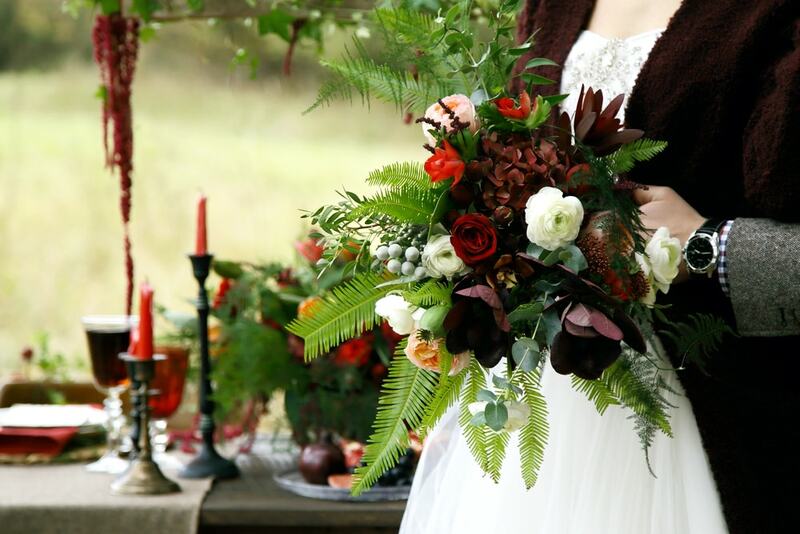 There are multiple ways to design a rustic bouquet including methods that craft a stunning seasonal theme. 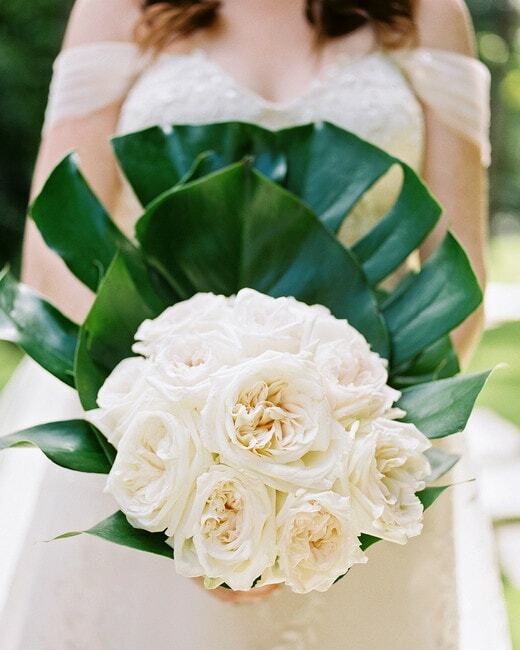 We like this bridal bouquet that sticks to a neutral color palette which provides it with a more versatile look. Rustic style bouquets are fitting for outdoor celebrations or barn weddings. Plenty of greenery and fresh flowers complete the natural theme of the arrangement to reflect the surroundings. 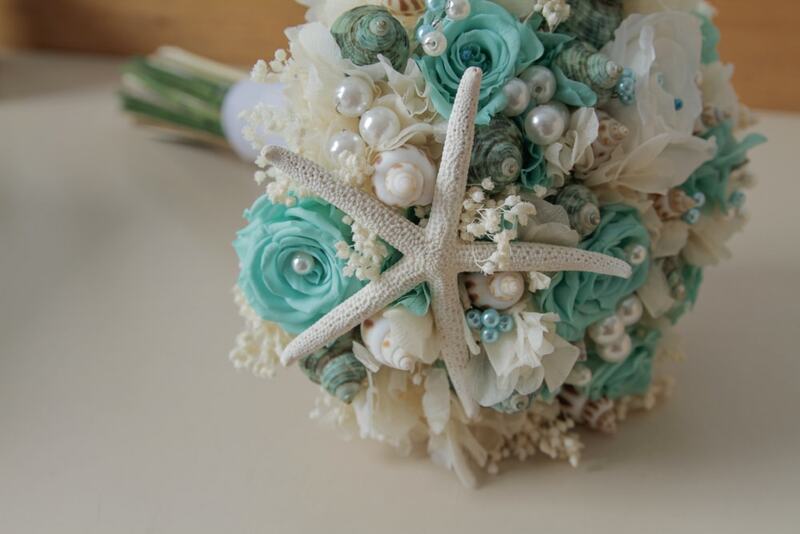 Brides who prefer sticking to a more specific theme will probably appreciate the aesthetic of this bouquet that comes with marine vibes. This is mostly due to the addition of relevant elements such as seashells and pearls. The pale turquoise roses also contribute to the coastal theme to create a meaningful look. Creating a rich arrangement of flowers and greenery represents a nice alternative to traditional bridal bouquets that tend to be simple and minimalist in style. Some brides can feel overwhelmed by the number of flowers in this bouquet, but this level of richness provides increased depth and makes the arrangement stand out during the ceremony. A great bridal bouquet trend that you shouldn’t overlook is the use of cascading flowers and vines. While the idea is definitely not new, cascading bouquets have been revitalized with some modern touches. If you put your creativity to work, you can obtain a one-of-a-kind arrangement. Take this bouquet of pink roses as an example. Its overall look doesn’t seem that impressive on its own, but adding cascading orchids boosts the visual effect to a whole new level. The colors are coordinating well to create a superb floral arrangement. Perfectly domed and symmetrically shaped bouquets can feel too old-fashioned nowadays. 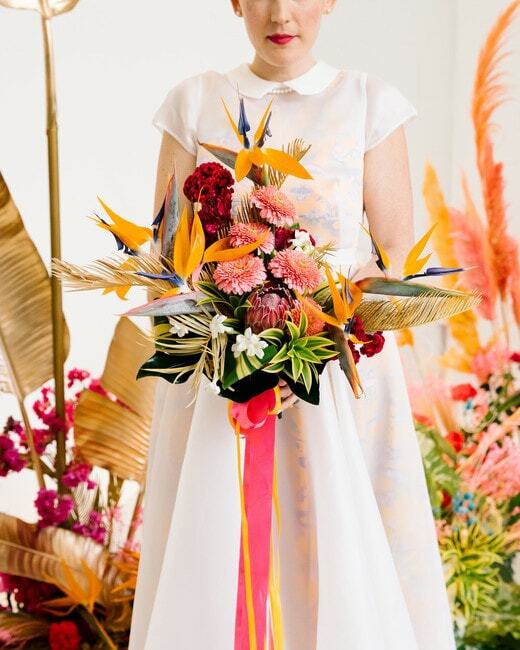 If you want to show off your free untamed spirit, it’s a good idea to try the trend of the asymmetric bridal bouquet. These floral arrangements step out of the usual conventions offering a design that has great modern appeal. It often mixes and matches competing flowers to create a more striking visual impression. Sometimes large foliage or other whimsical elements are used. 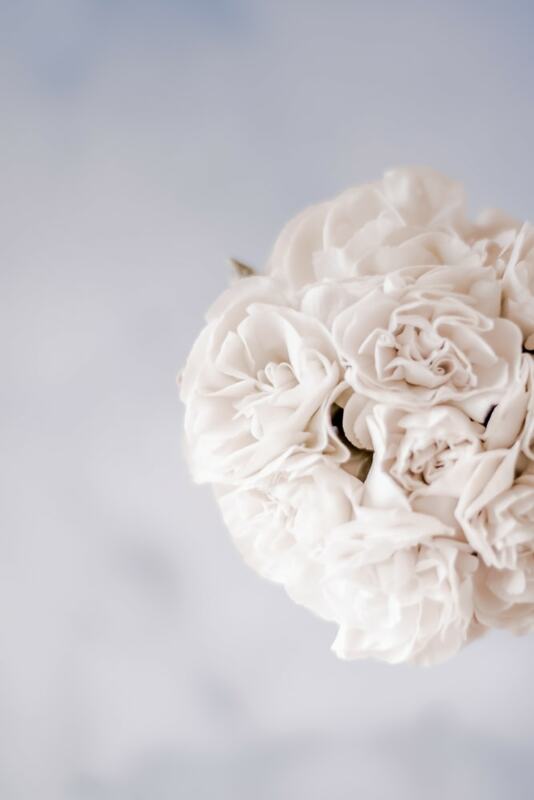 If you’re looking to add some soft textures, cotton is one underrated element to try for spicing things up in the floral arrangement of your wedding. 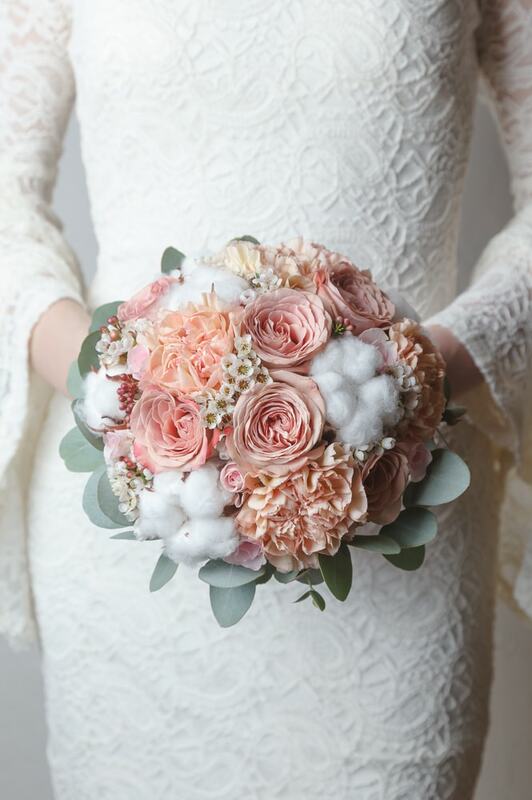 This bouquet has a very delicate and feminine look thanks to the combination of pretty pink flowers in pale shades and fluffy balls of cotton. Bringing in some ferns along the flowers of your bridal bouquet is highly recommended if the location of your wedding is near a forest. Ferns are a sweet option for enriching the bouquet and providing the perfect green backdrop to showcase some stylish floral varieties. 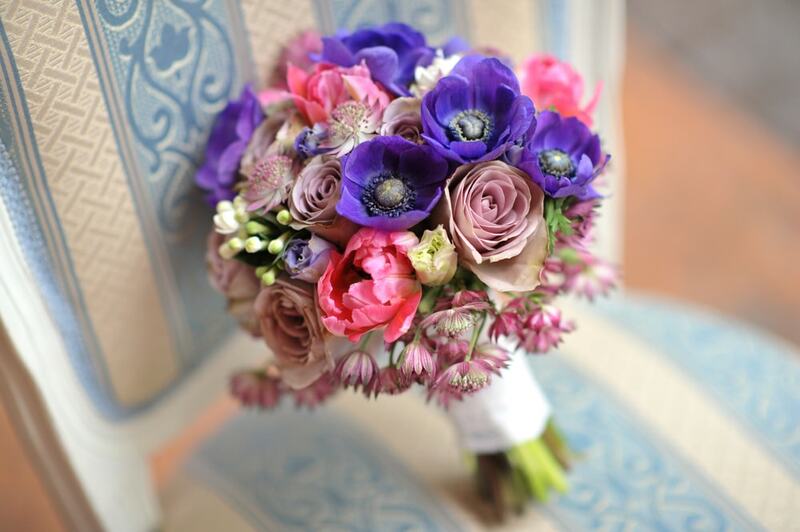 The deep shades of burgundy used for this bouquet look amazing when introduced together with neutral-toned flowers. 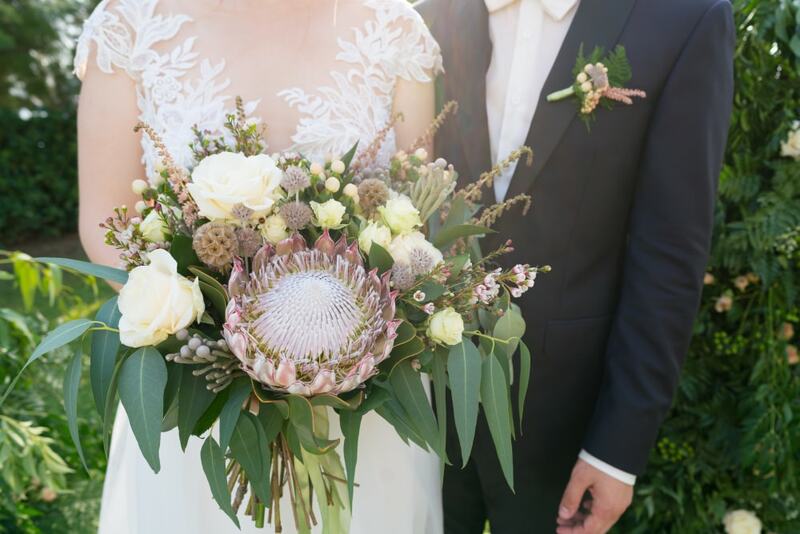 If you’re looking to design a unique bridal bouquet with a modern flavor, take a look at this inspiring arrangement that mainly features a large king protea flower. Its large visual punch is kept to more subdued levels with the help of other flowers and herbs. The result is a stunning floral arrangement that can be considered suitable for lots of wedding styles. 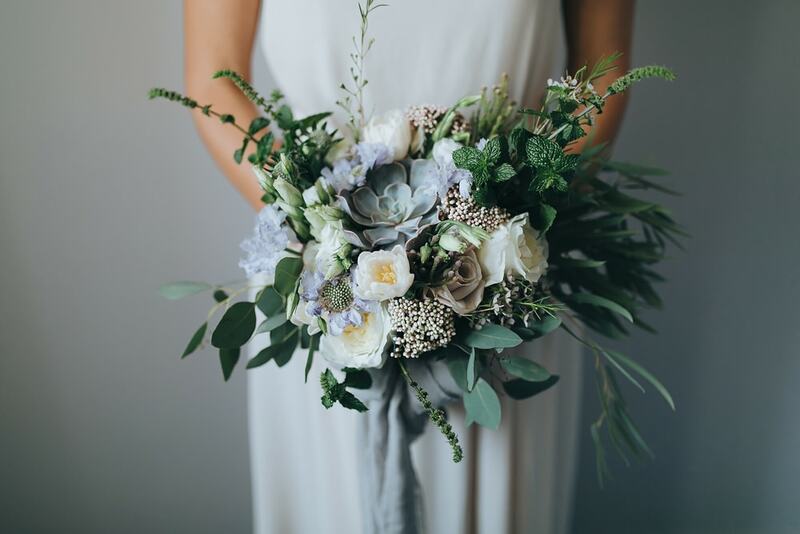 Considering the popularity of succulents around your house, it makes sense to bring their fresh style to a bridal bouquet. Incorporating succulents together with flowers will usually result in a fun and hardy arrangement. Bridal bouquets with succulents aren’t as easy to bruise when compared to those that feature mostly gentle flowers. It’s also recommended to include succulents for their pleasant texture that pairs well with many flower styles. If your wedding breaks the usual conventions, there’s no reason why the bridal bouquet shouldn’t follow suit. A collection of wildflowers can be a chic alternative to more traditional bouquets. As a bonus, you can also enjoy this kind of romantic look without spending as much money as wildflowers can be gathered from a local field. If you choose to buy them from a store, that’s still a good option that will cost less than the classic arrangements. The concept of “less is more” can be often applied when it comes to wedding bouquets. Sometimes sticking to a minimalist flower arrangement can have a more impressive visual effect. Feature only one or two flowers that hold a special meaning to you and the result is sure to be magnificent. 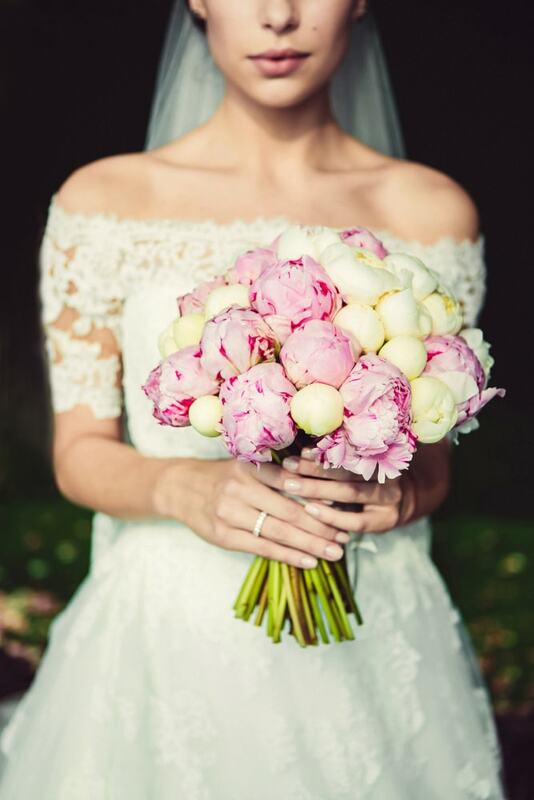 Peony petals are capable of crafting a gorgeous look for any bridal bouquet. 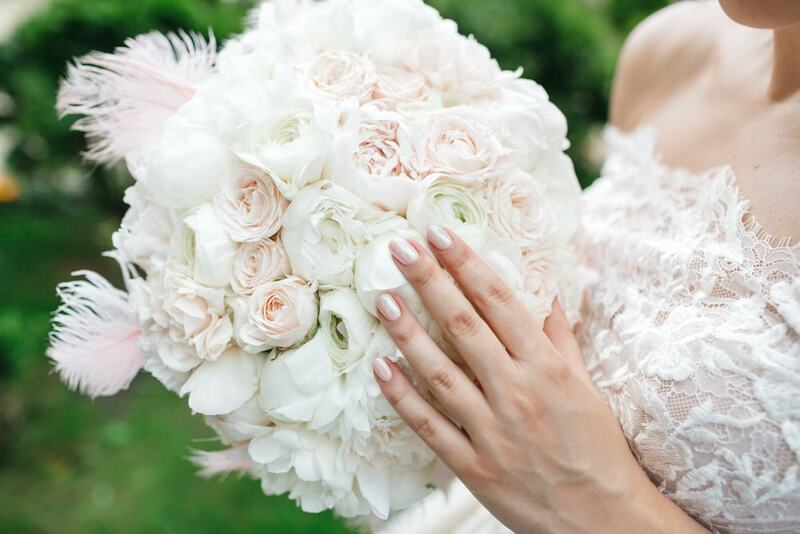 Multiple layers of pink peonies work well if you wish to add a feminine touch to your bouquet. Just a few hints of greenery can be helpful to keep things balanced. 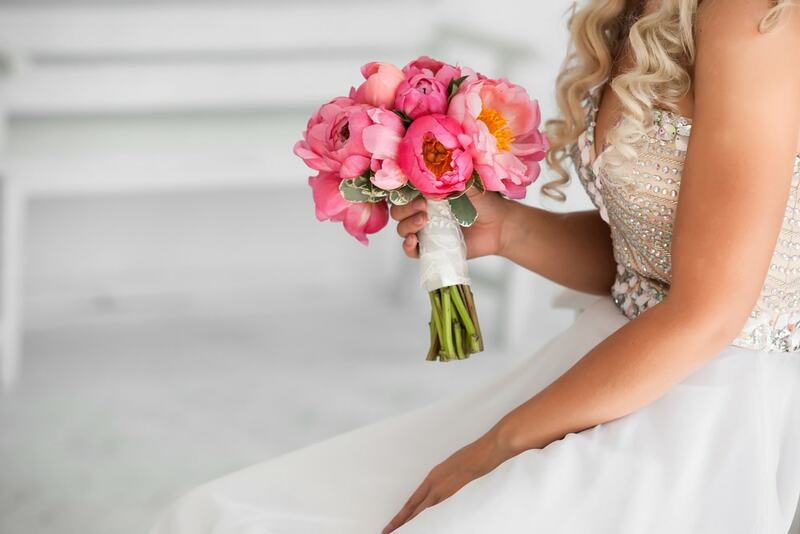 Peonies make for a beautiful choice to be used in bridal flower arrangements, but keep in mind that their season is quite limited. 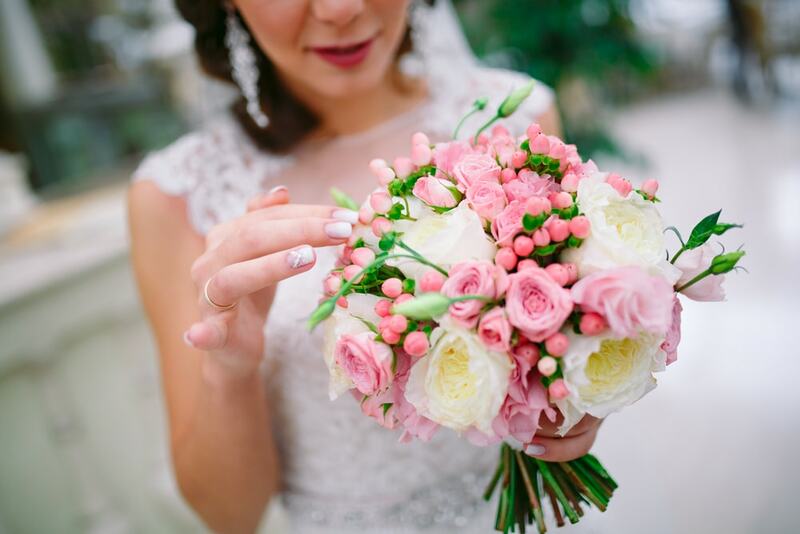 Some flowers aren’t as commonly used when it comes to bridal bouquets. One of them is the lush and fragrant hyacinth. 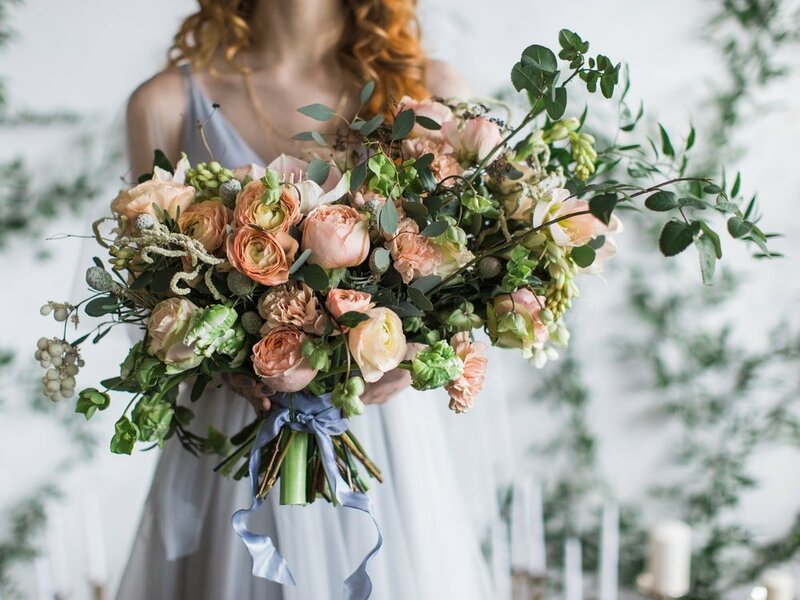 Both winter and spring brides should strongly consider incorporating these lovely flowers that represent low-cost alternatives to other popular options. 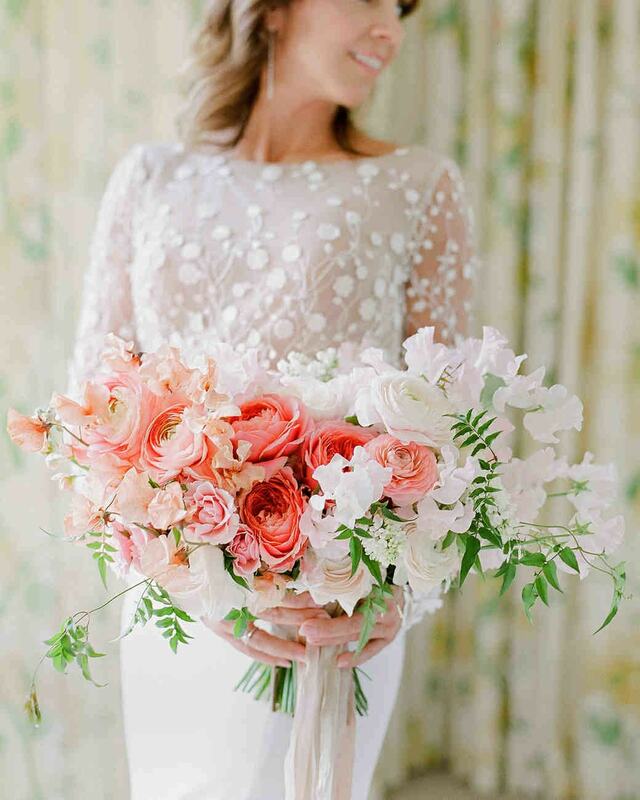 This bridal bouquet features only pink hyacinths and it looks quite gorgeous. Of course, you don’t need to stick to one type of flower, but hyacinths are easily capable of standing out on their own. 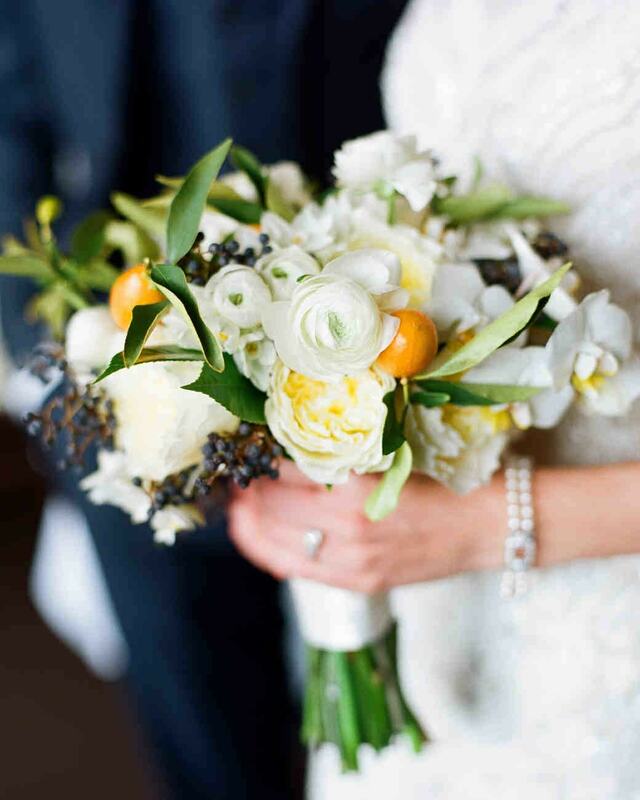 A great accessory to include together with your bridal bouquet is the pomander. 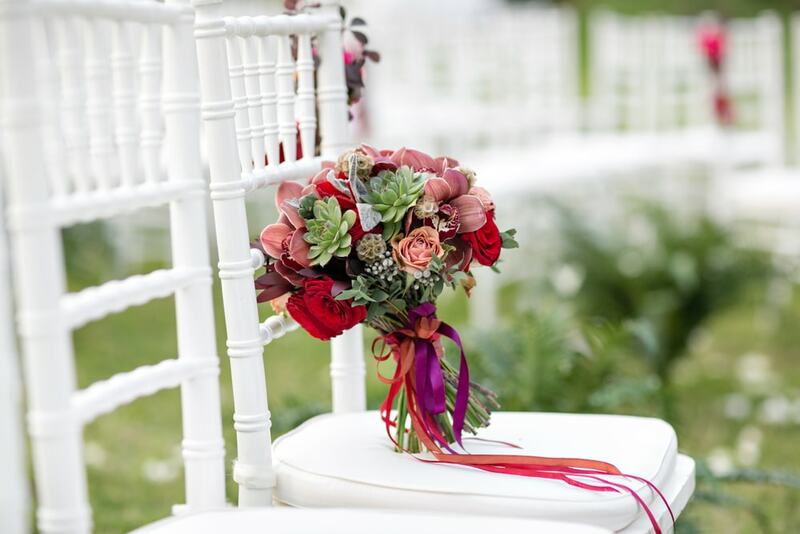 It’s not uncommon to find it at weddings as it looks very fashionable with a wide range of floral arrangements. Some of the best options include orchids, hydrangeas, and roses. 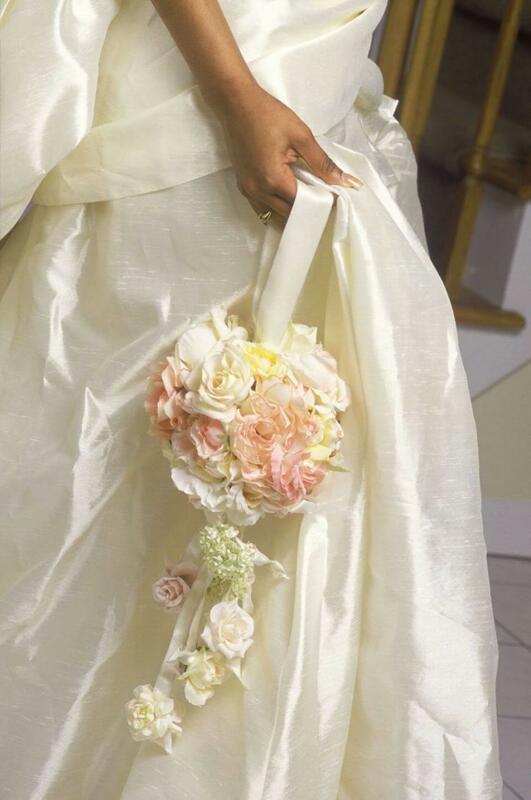 The bride’s job of carrying the bridal bouquet is also simplified given how the pomander can be handled by the wrist. 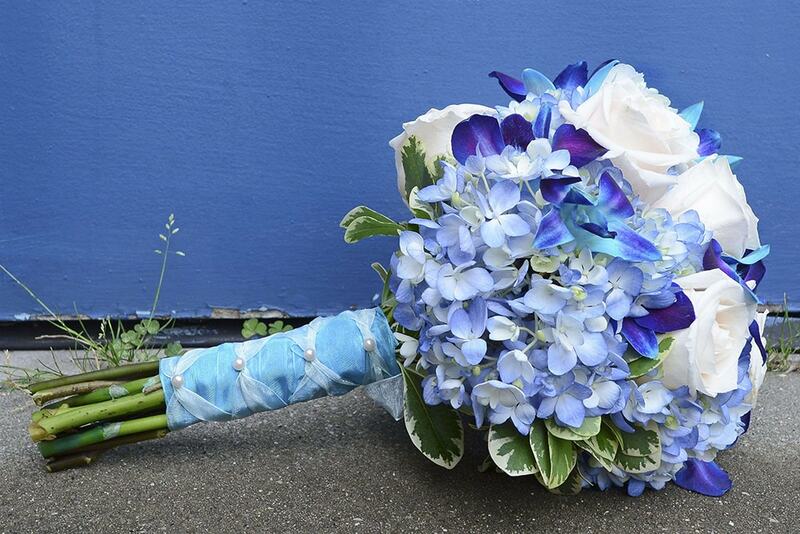 If you opted for a garden wedding in the summer, you should go for a blue bridal bouquet like this one made of hydrangea, orchids, and roses. The blue and purple combine with the stark white for an elegant impression. This is the kind of look that works well for the summer considering the cooling contrast obtained with the help of the blue bouquet. 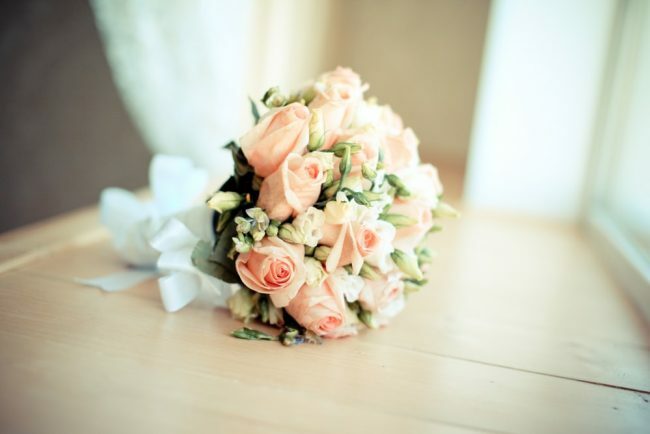 Selecting the right flowers for the bridal bouquet represents just one aspect when deciding on the ideal arrangement. Another important detail is how the bouquet is structured. Here we have a uniform arrangement that combines roses, ranunculus, and eucalyptus in a nicely balanced way. The consistent color scheme offers a stunning impression. In case you’re holding a beach wedding, you need a bridal bouquet that can match the tropical vibes of the location. This bouquet provides an excellent example considering the lovely blend of traditional white roses with green monstera leaves. The arrangement captures the essence of this romantic ceremony while giving it a tropical twist. Fans of the ombre look shouldn’t miss the opportunity of integrating this gradient effect onto their bridal bouquets. The way colors blend together in a soft manner offers a spectacular effect that’s sure to draw all the attention at the wedding. The addition of sweet peas greenery boosts the fresh effect of this bouquet composed of roses, ranunculus, and stock flowers. If you’re looking for some inspiration when it comes to the design of the bridal bouquet, you should take a close look at this structural arrangement. This exotic bouquet has a very customized look that makes it stand out from the crowd. The birds of paradise blooms are the main elements that provide its visual brilliance. It’s also worth mentioning how the dried sago fronds contribute to the vibrant appearance. While colorful bouquets are preferred by many brides, this doesn’t mean that more subdued arrangements can’t captivate the attention. 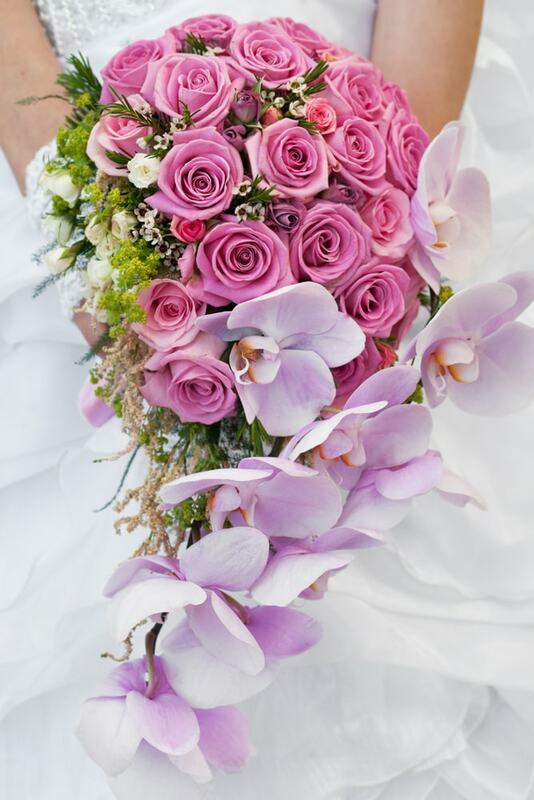 A bridal bouquet doesn’t necessarily require vibrant colors to be considered beautiful. Even if you use flowers with muted colors, the resulting effect can be quite breathtaking. Subdued bridal arrangements can make a statement on their own and this bouquet made up of clematis, lilac, and ranunculus among others should be able to impress at any wedding. Take notice of the modern design featuring a teardrop shape which adds some visual interest as well. There are many ways to create an unexpected effect when it comes to the bridal bouquet. One of the most interesting tricks is to use flowers that usually have a secondary role in arrangements, and feature them as the main element. 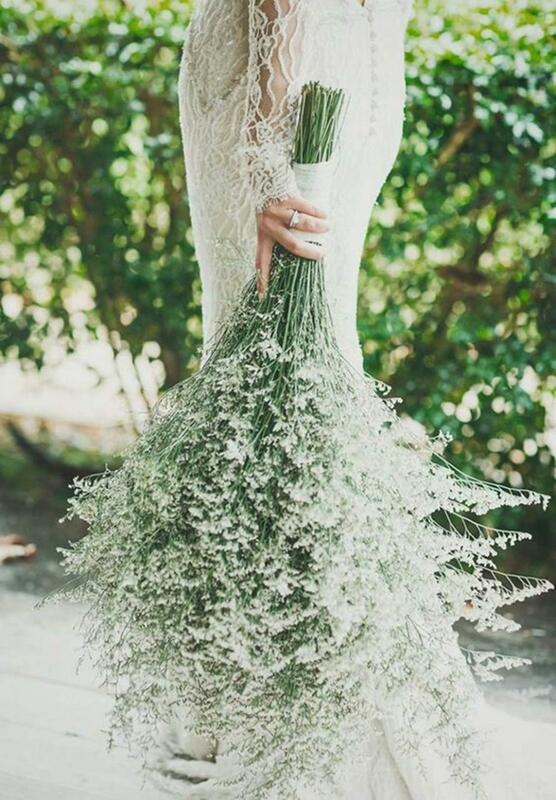 In this bouquet, baby’s breath flowers take center stage instead of being used as filler. This is definitely a modern bridal bouquet that can be suitable for more whimsical style weddings. For an enhanced look, keep the flower’s long stems together in a binding. 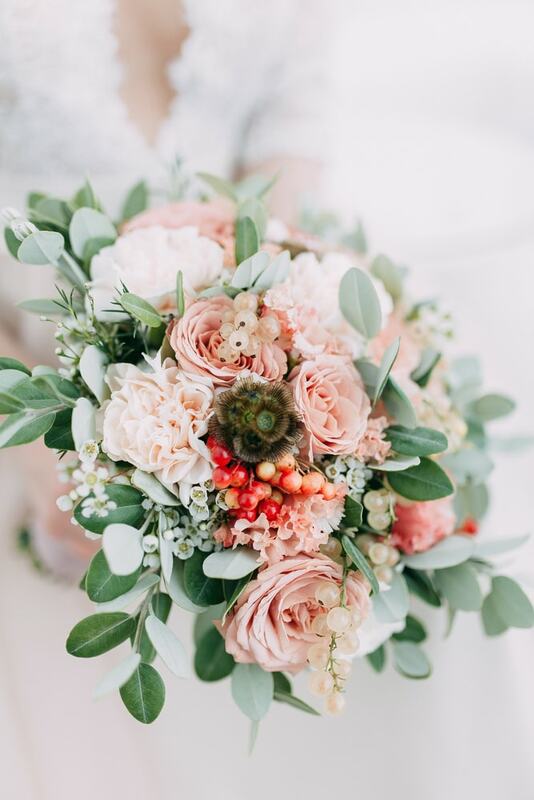 Depending on the setting of your wedding, bridal bouquets that use cooler hues of color can be a better choice compared to warmer tones. 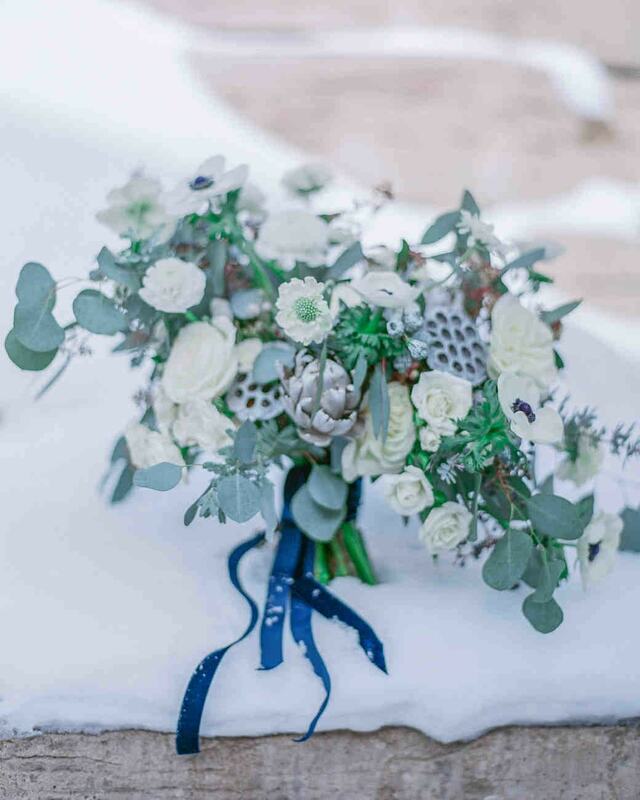 Take a look at this elegant bouquet that combines blue and green shades that can fit a snowy winter wedding perfectly. The arrangement is composed of anemone, roses, lotus pods, and eucalyptus wrapped with a matching ribbon. When it comes to adding fruits to your bridal bouquets, there are lots of interesting options to consider. Berries are good examples, but to give the arrangement a more exotic vibe, try bringing in some kumquats. This is an unexpected element that provides a unique twist to the overall look of the bouquet. These fruits are like little oranges that add a pop of color to a bouquet made up of mainly white flowers. The lisianthus, ranunculus, and orchids used for this arrangement are beautifully highlighted by the vibrant kumquats. 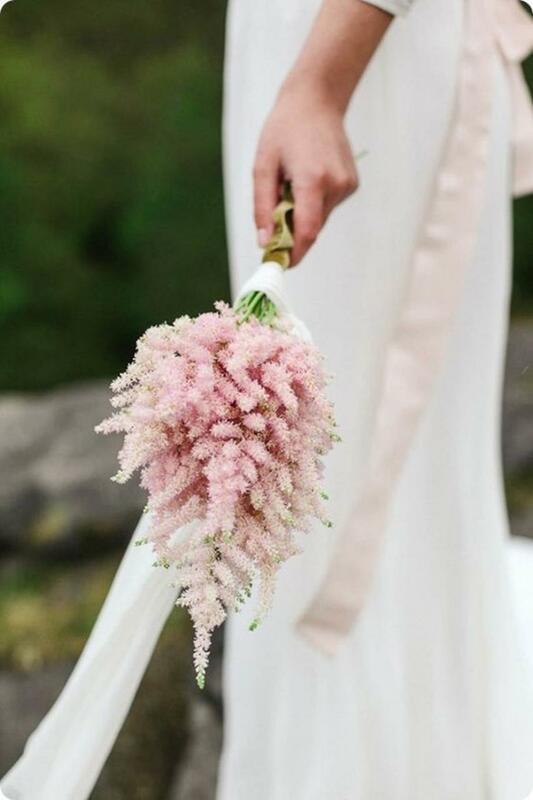 Similar to baby’s breath, astilbe isn’t usually in the spotlight when it comes to floral wedding arrangements. You can change that if you wish to craft a unique bouquet that breaks the traditional conventions. A bouquet made up only of astilbe flowers has a very delicate look and the arrangement feels dense thanks to the textural qualities of this elegant bloom. The right flower can make any bridal bouquet draw all the attention. If purple is your favorite color, perhaps going with an arrangement of hydrangea flowers represents a good solution for your wedding. The globe-shaped bloom of hydrangeas looks very stylish and you don’t need lots of blossoms to make a statement.